While shopping at Robert's for my next project (so exciting, keep an eye out!) 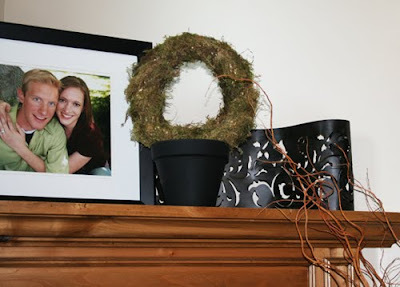 I saw a circular wreath in a pot that I knew I needed...my husband would probably disagree...but I needed it. Price tag- $45!?! Time it took me to decide to make my own version...45 seconds. 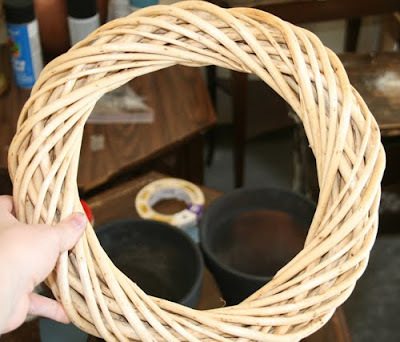 -Went to a local thrift store and found a brand new wreath form for $1.99. -Took it home and with the spray adhesive and extra moss I had from this project covered the form. -Stuffed a terracotta pot I had laying around (and already spray painted black) with plastic bags and covered the bags with a layer of moss. -Glued the wreath on top of the pot. -Voilà, a beautiful knockoff at a fraction of the price. so freaking cute,, gotta try this. I love it! You transformed it. Oh your site is too cute!! SO many fun finds!!! Thanks for adding it to the blog roll overt at Blue Cricket!! !